Water, Milk Protein Isolate, Calcium Sodium Caseinate. Less Than 1% Of: Maltodextrin, Inulin, Natural and Artificial Flavors, Canola Oil, Sunflower Oil, Cellulose Gum and Gel, Dipotassium Phosphate, Whey Protein Concentrate, Soy Lecithin, Magnesium Phosphate, Potassium Chloride, Sodium Hexametaphosphate, Dimagnesium Phosphate, Sodium Phosphate, Acesulfame Potassium, Potassium Citrate, Ascorbic Acid, Carrageenan, Ferric Pyrophosphate, Dicalcium Phosphate, Sucralose, Tricalcium Phosphate, DL-Alpha Tocopheryl Acetate, D-Calcium Pantothenate, Niacinamide, Zinc Oxide, Copper Gluconate, Vitamin A Palmitate, Pyridoxine Hydrochloride, Thiamine Mononitrate, Riboflavin, Chromium Chloride, Folic Acid, Biotin, Potassium Iodide, Cholecalciferol, Cyanocobalamin. Use this product as a food supplement only. Do not use for weight reduction. 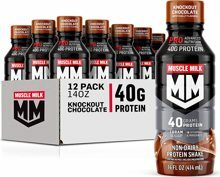 Muscle Milk Pro Series 40 provides nutrients found in natural milk that are important for building muscles and bones. Water, Milk Protein Isolate, Calcium Sodium Caseinate. Less Than 1% Of: Maltodextrin, Inulin, Canola Oil, Sunflower Oil, Cellulose Gum and Gel, Dipotassium Phosphate, Whey Protein Concentrate, Natural and Artificial Flavors, Soy Lecithin, Magnesium Phosphate, Sodium Phosphate, Acesulfame Potassium, Potassium Citrate, Ascorbic Acid, Salt, Carrageenan, Ferric Pyrophosphate, Dicalcium Phosphate, Sucralose, Tricalcium Phosphate, DL-Alpha Tocopheryl Acetate, D-Calcium Pantothenate, Niacinamide, Zinc Oxide, Yellow #5, Copper Gluconate, Vitamin A Palmitate, Pyridoxine Hydrochloride, Thiamine Mononitrate, Riboflavin, Chromium Chloride, Folic Acid, Biotin, Potassium Iodide, Cholecalciferol, Cyanocobalamin. Water, Milk Protein Isolate, Calcium Sodium Caseinate, Less Than 1% Of: Maltodextrin, Inulin, Dipotassium Phosphate, Whey Protein Concentrate, Canola Oil, Sunflower Oil, Cellulose Gum and Gel, Soy Lecithin, Natural and Artificial Flavors, Sodium Hexametaphosphate, Potassium Chloride, Acesulfame Potassium, Potassium Citrate, Ascorbic Acid, Sodium Phosphate, Ferric Pyrophosphate, Carrageenan, Dicalcium Phosphate, Sucralose, Tricalcium Phosphate, DL-Alpha Tocopheryl Acetate, D-Calcium Pantothenate, Niacinamide, Zinc Oxide, Copper Gluconate, Vitamin A Palmitate, Pyridoxine Hydrochloride, Thiamine Mononitrate, Riboflavin, Chromium Chloride, Folic Acid, Biotin, Potassium Iodide, Cholecalciferol, Cyanocobalamin. Water, Milk Protein Isolate, Calcium Sodium Caseinate, Less Than 1% Of: Alkalized Cocoa Powder, Maltodextrin, Inulin, Natural and Artificial Flavors, Dipotassium Phosphate, Whey Protein Concentrate, Magnesium Phosphate, Canola Oil, Sunflower Oil, Soy Lecithin, Sodium Hexametaphosphate, Acesulfame Potassium, Cellulose Gum, Potassium Citrate, Ascorbic Acid, Potassium Chloride, Sodium Phosphate, Salt, Ferric Pyrophosphate, Dicalcium Phosphate, Sucralose, Carrageenan, Tricalcium Phosphate, DL-Alpha Tocopheryl Acetate, D-Calcium Pantothenate, Niacinamide, Zinc Oxide, Copper Gluconate, Vitamin A Palmitate, Pyridoxine Hydrochloride, Thiamine Mononitrate, Riboflavin, Chromium Chloride, Folic Acid, Biotin, Potassium Iodide, Cholecalciferol, Cyanocobalamin. Some people are easily satisfied. For them, good is enough but for others, satisfaction doesn't exist. What does exist is an unquenchable desire to complete one more rep, one more sprint, one more grueling workout. 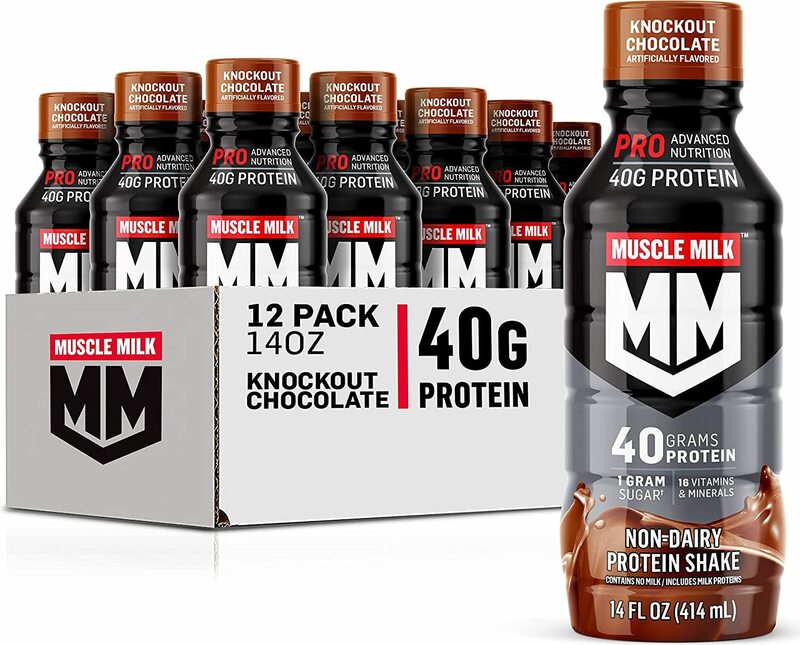 Muscle Milk Pro Series gives you 40 grams of protein to fuel your recovery and help build strength because we know you want to push your limits. It isn't for some people. It's for you. Muscle Milk workout recovery fuel. Give me strength. Contains ingredients derived from milk and soy. Muscle Milk Pro Series provides nutrients found in natural milk that are important for building muscles and bones.